The deadline is Oct. 28 for the Atlanta qualifying competition. Competitors must be an undergraduate student currently enrolled at a recognized university or college as well as the owner/controlling shareholder of the business and principally responsible for its operation. The company must be structured ‘for-profit’ and have generated $500 or received $1,000 in investments by the time of application, and have been in business for at least six consecutive months. 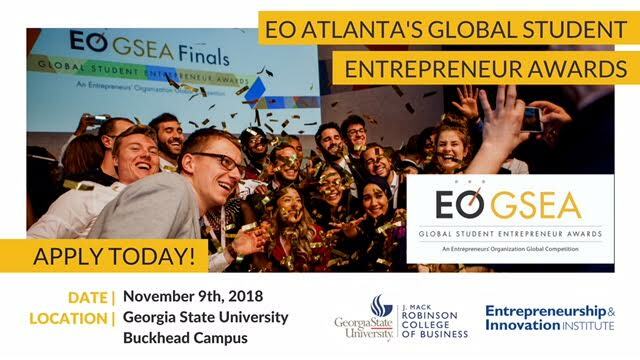 The student entrepreneurs will make presentations to a slate of EO Atlanta judges on Nov. 9 at the Georgia State University Buckhead Center 3348 Peachtree Road. A regional winner will be selected that day and will move to the regional completion, and, if successful, the national competition. The final prize will be awarded at the global final celebration in the resort and trade hub of Macau, “the Las Vegas of Asia,” along China’s southern coast in April 2019. Additional eligibility requirements, entry forms, and other details can be found at www.gsea.org.